Many parents have had bad experiences when they learned of their child's diagnosis. DSDN is running a campaign this month with #deardoctor letters. I encourage everyone to go and like their page. (This is the organization that has the amazing rockin mom groups). The following is my letter to medical professionals. I am writing to share my diagnosis story with you. Each parent has their diagnosis story, the time in which Down syndrome became a part of their family, but I have never really discussed mine. Unlike so many fellow parents, I haven’t written to a doctor about our diagnosis story. Many parents have chosen to write either to thank them for the way in which they shared the diagnosis, or has is often told, families writing and asking their doctors to reexamine the manner in which they share this type of news to other families in the future. The reason I haven’t written before is because my diagnosis story wasn’t much of one and didn’t fit neatly into either one of those categories. My story is a little bit different than most as mine took place after my son was born. Two days after my son’s premature birth, I joined my son’s neonatologist on the couch in his NICU room and listened as she gave a report on his health. It had been a whirlwind 48 hours with him arriving 12 weeks before his due date, weighing 2lb 2oz, housed in the NICU, connected to monitors and machines, and having a heart defect. While that is a lot to take in in a 48 hour window, he had been holding stable, so I was managing to hold myself together as well. While sitting on the couch hearing her run through his medial information she threw it out there in between information on his blood sugar and blood pressure numbers. 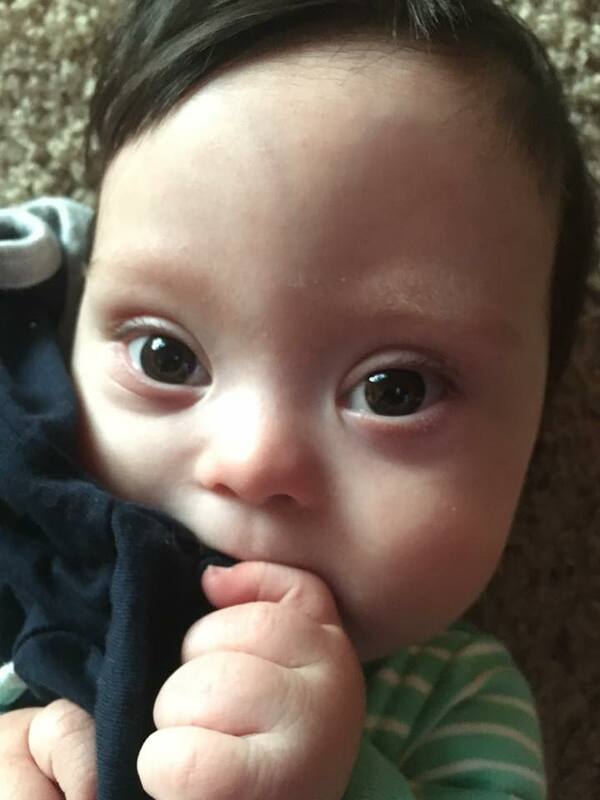 In between all of his numbers and information she said “the results came back and he tested positive for Trisomy 21” and kept right with giving the rest of the report. For a while I hated how she just threw it out there while I sat in his NICU room by myself. While I will gladly share just how much I love my son and how much he completes our family, this is not news parents are typically anxious to receive. Now looking back at that time, I’m not exactly sure what I would have wanted. I remember feeling as if her announcement did not match up to the major life altering news that she delivered. Now I’m not sure what I was expecting, did I want a drum roll or dramatic movie music? Now a year removed I am very appreciative of her approach. In telling me the way she did she showed me just where she ranked this diagnosis; right there between his all of his other medical notes. It is part of his medical file and not who he is. She did not follow up the statement with an apology or pity. She didn’t pause and say, “I’m sorry to tell you but…” She simply threw it out there between his blood sugar and blood pressure. In fact only when she saw the quiet tears streaming down my face did she pause and ask what was wrong. I explained how it was a shock to hear this news thrown in the middle of his usual health update and how it was a lot to process. While in reality at that moment I wanted to tell her how she with that statement shifted my world. I then proceeded to say to myself as much as her, “now what?” To which she looked at me as if she was having a hard time understanding my concern and said “we treat him just like any other baby.” Her answer spoke volumes. In her way she was also saying, we love him just like any other baby, and I watched her do just that as she came into his room each time. While I struggled to wrap my head around this new life that was to be ours she set the stage. The neonatologist’s statement of, “we treat him just like any other baby,” often goes through my head. She taught me so many lessons with those eight words. She taught me acceptance. She taught me to look beyond this note in his medical file. She also taught me to advocate for my son as she was doing while I, his mother, worked to process the news. So medical professional, whether you are a genetic counselor, an OB-GYN, neonatologist, or other professional who might give this type of news to a family, I hope you understand the role you will now play in their family story. They might not ever remember your name, but I promise they will remember in great detail what you say and how you respond. Whether this news is given as a prenatal diagnosis or birth diagnosis, this news will be a lot to process. Please understand the significance of your role and that you are setting the stage. I would encourage you to remember the neonatologist’s words to me; “We treat him just like any other baby.” That baby lovingly tucked in their mother’s womb is just like any other baby. That baby is still a miracle just like any other baby. That mother has had hopes and dreams for that baby since two lines first appeared on the pregnancy test just like any other baby. I ask that you please treat this news with the kindness, assurance, and hope that would be afforded to mothers, just like any other baby. My son’s diagnosis came in-between blood sugar and blood pressure numbers and that is where it fits; as part of his story and not his whole story. He has a quite a story. One that is filled with love, laughter, and hope; just like any other baby.